Softmachine, a four-year project, 2012-16, by Berlin-based Singaporean artist and performance maker Choy Ka Fai, has generated four widely travelled dance performances and 88 video interviews with choreographers in 13 cities in five countries across Asia. The work offers unprecedented visibility to enormous varieties of regional dance forms and choreographic thinking. With two performance works and the video interviews (unfortunately only accessible in the first week of the festival), Softmachine featured as the best of the Liveworks’ program. 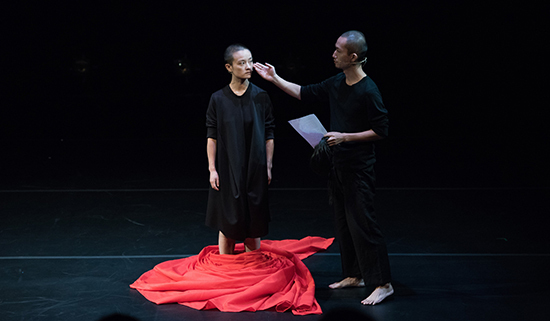 Although described as “documentary performance” (catalogue)—an apt term for the other Softmachine performance in Liveworks by Indonesian dancer Rianto—XiaoKe x ZiHan is more dramatically organic, focusing consistently on the emotional impact of intensifying political repression of art in China. ZiHan, in silhouette from behind a large red curtain that dominates the stage, plays an interrogator. XiaoKe, his subject, clutches a ball of white material which, leaning into, she pushes abjectly about the floor; sliding, crawling, rocking. She is asked her age. “37.” “Contemporary dance?” “Physical theatre.” Where? “Not in official venues. No licence needed.” Nor, she says, do they need a licence to performance overseas. She is asked about Choy Ka Fai. “Fat, like a businessman.” “Why the crawling?” “To express struggle” is her provocative, mock ideological retort. The curtain falls to the floor, the interrogator appears to collapse and our attention is drawn to the screen where XiaoKe x ZiHan are seen in their apartment, with a glimpse of one of his six cats. Chopping vegetables, she muses about their being together: “Love? Artistic collaboration and a defence against loneliness?” The couple go walking. We see couples dancing in daylight in city squares. She reveals to us she’s a Communist Party member; she had to be if she wanted to a journalist, the role she trained for at university. It was the only way to legally access parliamentary business. Back home, ZiHan cuts her hair. She explains that it’s not the “system” they oppose; they just want to know the truth. We then see them with friends in a bar; moving clothes racks down a street in a performance; and, on a train in another performance, applauding with friends station names as they’re announced. The film conveys the everydayness of their life and art, a kind of innocence. We momentarily forget the threat embodied in the opening scenes, the dominating red curtain, the voice of the interrogator. Now the floor is fully covered with the curtain, as if taken over by the artists. ZiHan, to one side at his computer, plays his score, its buzzing and tinkling asymmetrical to XiaoKe’s abstracted traditional folk dance (the form she’d been trained in as a youngster), her centre of gravity low, arms wide, elegant, fluent. Staccato piano and a larger, ominous sound inflected, I think, with traditional music, lends the movement additional drama as XiaoKe slips between folk, martial art and contemporary dance moves, her prancing widening around and diagonalling across the red floor. The building freedom of her expression is halted. “Stop,” says the interrogator. “What are you doing?” “Dancing,” she replies. The interrogation this time is palpably threatening, with XiaoKe frozen, ZiHan again playing inquisitor but now onstage touching an arm, a cheek, a breast (XiaoKe pulls away). “Everything has to be absolute in China,” he says. Onscreen, the pair gently mock absolutes, performing the propaganda Laundry Song as a pop video, with XiaoKe as a young woman singer (digitally multiplied) in traditional dress on a river bed, declaring her desire to help the Peoples Liberation Army (represented by ZiHan) do its laundry. At a time when President Xi Xinping’s campaign against “nihilism” (criticism in any form of Communist Chinese history) is escalating (“Nihil sine Xi,” The Economist, 29 Oct), the makers of even light-hearted works like this video can be punished. ZiHan binds the utterly still XiaoKe with the cloth pieces—around her waist, crisscrossing her chest, around her brow. He lays out a white cloth on the floor, the music throbs, she binds him too in red. They look oddly like ancient warriors. Sharing a bottle of water, they wash down tablets and lie down side by side on the cloth—a stark double suicide image we’re familiar with from Japanese Bunraku and Kabuki, here love and art defeated by ideology. The red cloth, symbol of absolute power, despite their taking control of it and subsuming it to their art, defeats them regardless. Alternatively, XiaoKe x ZiHan have taken it with them into oblivion. 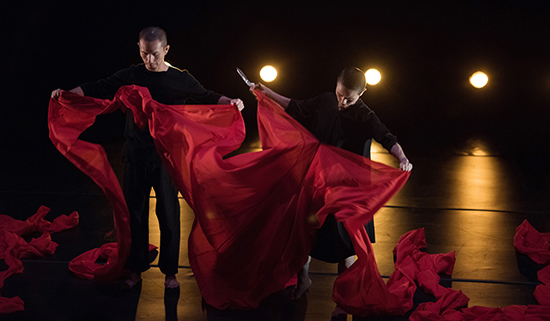 Choy Ka Fai’s conception and direction, Tang Fu Kuen’s dramaturgy and the craft and, for all the work’s intensity, the gentle, sad presence of XiaoKe x Zihan have produced a deeply affecting personal and political work of art. 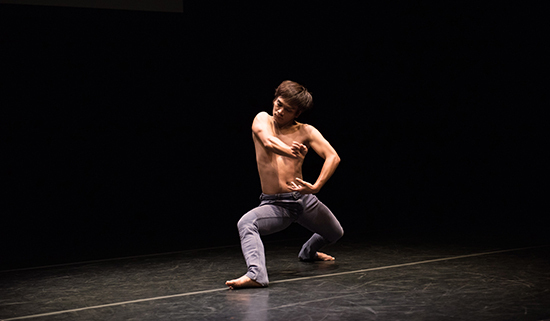 Indonesian dance artist Rianto addresses us directly, from stage and screen, about his life and art. 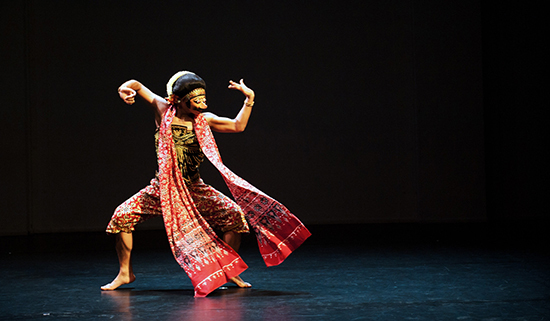 He illustrates the art with excerpts from classical Indonesian Topeng dance, Lengger folk dance and contemporary dance. In Topeng’s Javanese Ramayana dance drama he performs, masked (Topeng means mask) as the princess Sekaritij awaiting her beloved prince, Panji. Rianto describes it as “a dance of love, pain and hope,” adding, “Love always comes with pain. I know this.” Elaborately and glitteringly costumed, Rianto’s elegant movement is highly articulated, almost puppet-like at times (referencing the form’s origins), when, with back extremely arched, the masked head moves sharply side to side, or hands dance from wrists. In documentary film which takes us to Rianto’s village in Java, he and his mother reveal that, when a child, a blue birthmark between his brows foretold that he would be a Lengger dancer. He tells of marrying one of his traditional dance students, a Japanese woman, moving to Tokyo, teaching (we see him preparing wigs and costumes for his students who dance with him on an outdoor stage to a large audience) and, after the performance, heading to Shinjuku to wind down with “sauna and DVDs…with gays and bisexuals.” Choy, off camera, stops Rianto, asking, “So I can’t use any of this material?” Rianto answers with a grin, “Depends.” The oscillation between gender roles, the “no gender” declaration and this moment take us to the work’s conclusion, Rianto’s idealised, fantastical vision of a transcendent self. Rianto, a distant figure, his back to us, emerges from utter darkness into a narrow corridor of low light, purple and pink, his skin glittering. As a deep accompanying score is layered with high bell notes, he glides nearer, the soft angular moulding of shoulders and elbows subtly evoking ancient dance. He stops and turns to us, naked, a man, of “no gender” in art…and life?